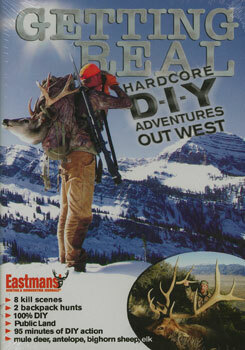 Eastmans’ is proud to present their first 100% DIY DVD. This 95 minute DVD is action-packed with some of the most extreme hunts that the West can dish out. “Getting Real” has it all: deer, elk, antelope and bighorn sheep with conditions ranging from hot and dry to -15 degrees. All the tags used in the hunts on this DVD were obtained on the same pool as everyone else or over the counter tags. It took a lot of hard work to put “Getting Real” together, and we hope you enjoy the reward of our effort. This is fair chase hunting – the Eastman way. Check back in a week from today to see the winner. $14.95 Value – Yours FREE if you win!